The Corangamite Soil Health Knowledge Base is a repository of soil health information for the Corangamite region of Victoria. It assists land managers and other stakeholders to implement catchment management plans across the region. The Knowledge Base was developed in collaboration with Corangamite CMA and was awarded the 2015 Victorian Spatial Excellence Award and the 2015 Asia Pacific Spatial Excellence Award, Environment and Sustainability category. The aim of the Corangamite Soil Health Knowledge Base was to develop a comprehensive, informative, intuitive-to-use knowledge base of soil health information that would assist the broader community to better understand the values of the soils of the Corangamite region of Victoria. Detailed soil data and information had been collected in the Corangamite region for nearly 80 years: Past data provides valuable baseline data to analyse the veracity and transferability of soil health information. Commencing in June 2013, the Corangamite Soil Health Knowledge Base was developed in collaboration with the Corangamite CMA and the Corangamite CMA Land Health Program Steering Committee. It assists land managers and other stakeholders to implement catchment management plans across the region. The Knowledge Base makes accessible a comprehensive range of reports, research papers, maps, soil profiles, soil test data, digital soil maps, land capability maps, geo-hazard maps, hazard susceptibility maps, images and other resources. It comprises a searchable online library of resources and an interactive map portal. The mapping portal now provides real-time access to federated soils data from disparate databases held by authoritative sources including Geoscience Australia, the CSIRO Soil and Landscape Grid of Australia as well as legacy data held by government agencies such as the former Victorian Soil Conservation Authority and the Department of Agriculture. Community-contributed soils data from over 100 farm test soil locations sites are included; these enable trends in soil health indicators to be visualised. Soil data from academic research projects is also included e.g. fine resolution digital soil maps from a recently completed PhD project. spatially locates and draws plans for on-ground works and then develops proposals guided by templates. The Corangamite Soil Health Knowledge Base was awarded the 2015 Victorian Spatial Excellence Award and the prestigious 2015 Asia Pacific Spatial Excellence Award, both in the Environment and Sustainability category. This project led to CeRDI’s involvement in a Soils Interoperability Experiment (under the auspices of the OGC) to harmonise existing global soil information interchange standards and demonstrate the technology to interoperate between disparate systems. 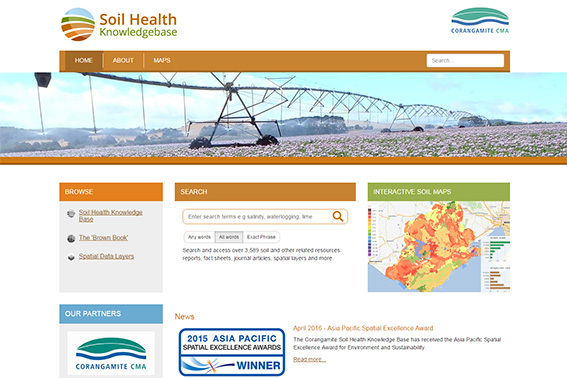 The Soil Health Knowledge Base comprises two main components: an eLibrary of digital documents, web pages, images and multimedia that is easily searchable; and an interactive map portal to discover spatial soil data. The map portal is based on spatial data infrastructure (SDI) that has been developed and deployed to federate soils data from disparate database sources into a single web portal thereby making data more easily discoverable. Where possible, the portal offers real-time access to remote authoritative databases by integrating the interoperable web services they each provide. In cases where the data already exists in other web locations, linked data technologies are used to connect to that remote resource. Although some data are consumed via interoperable services, there are a number of datasets hosted and delivered by the Soil Health Knowledge Base. Spatial data engines Mapserver (www.mapserver.org) and Geoserver (geoserver.org) are used for the Geospatial processing and service delivery using Open Geospatial Consortium (www.opengeospatial.org) standards. Vector data is commonly stored within a MySQL or PostGIS database and raster data is dynamically processed from its native format. Through this project, spatial information systems were adopted to enable users to focus on their geographic region and provide relevant and informative answers to their questions via an intuitive-to-use web-portal. Delivery of soil property observations via Open Geospatial Consortium (OGC) services. Continue to integrate and help improve the Digital Soil Mapping (DSM) activities at state, national and international level. Increase the level of private soil information included in the knowledge base. Mr Bret Ryan, Land Health Manager, Corangamite CMA. Dahlhaus, P.G., Nicholson, C, Ryan, B, MacLeod, A and Milne, R. (2016) Liberating soil data for profitable agriculture and catchment health in the Corangamite region, Australia. 'Soil, a balancing act downunder'. A joint conference of the New Zealand Society of Soil Science and Soil Science Australia. 12–16 December, Queenstown, New Zealand. Ritchie, A., Medyckyj-Scott, D., Wilson, P., Simons, B., Dahlhaus, P.G., MacLeod, A., Roudier, P., Gregory, L and Watson, B. (2016) Developing a global soil data infrastructure - The Open Geospatial Consortium Soil Data Interoperability Experiment. Soil, a Balancing Act Downunder. Joint conference of the New Zealand Society of Soil Science and Soil Science Australia. 12–16 December 2016, Queenstown, New Zealand. Oral Abstracts, p. 112.